As an e-commerce company, staying relevant is paramount. This includes maintaining a clear understanding of market trends and ensuring Cost, Convenience and Customer Experience are taken into consideration (amongst other things) to deliver the best products to market and quality service to your customers. Now, a question for you: How are you maximizing new logistics methods to enhance your customer experience, while reducing logistics complexity and costs within your business? In a world of constant change and growing connectivity, ordering products online is easier than ever. In the highly competitive and evolving e-commerce market, businesses are consistently seeking ways to generate and maintain a sustainable competitive advantage. In addition, market forces are driving consumer behavior to expect faster and free delivery with lower cost when buying. A wave of new direct-to-consumer logistics models are emerging in support of the consumer-driven supply chain that can help provide a competitive advantage for companies that are willing to adapt. According to the U.S. Census Bureau, the United States imported more than $440 billion in goods from China in 2013, representing 19.4% of all goods imported into the United States. Let’s use the China-to-U.S. trade lane as an example of a new direct-to-consumer logistics model. In a traditional supply chain, the customer may be required to deal with multiple service providers throughout the logistics process, creating multiple opportunities for error, multiple contacts for customer service when things go wrong, and multiple contract negotiations and invoicing reconciliations within the business. Not to mention fragmented shipment visibility, and—if you have slow-moving stock sitting in a warehouse—impacting your bottom-line. 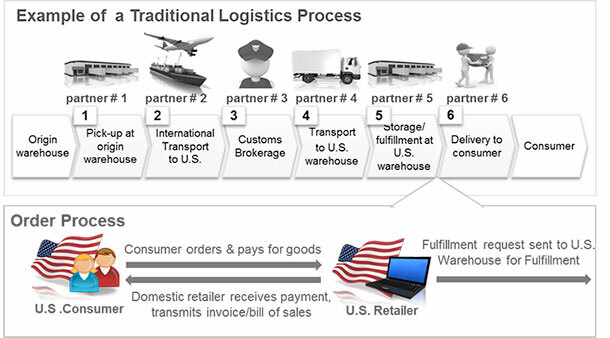 The direct-to-consumer model provides a simplified and seamless logistics process shipped directly from the manufacturer in China and direct to the U.S. consumer. If you use a single-source solution provider, you gain the advantage of bypassing your U.S. warehouse (saving up to 20% in direct costs) and increased piece-level end-to-end tracking, while reducing your logistics complexity by dealing with only one company. That leaves you with the time to focus on driving your business forward. Do I want to spend more time working on moving my business forward rather than dealing with a multiple carriers? Do I want to gain a cost advantage over my competitors? Does my current sourcing and distribution strategy enable one carrier? Do I have comprehensive end-to-end visibility? If you’d like to learn more about DHL eCommerce’s direct-to-consumer solution, please click here.